Long time no write. After taking some time to simply exist, I am back with a heavy case of ambition and a mild case of jet lag, naturally. The purpose of our Vancouver trip was born from a need to see our recently-relocated friends. With no proper itinerary planned, no interest in outdoor activities, and no actual idea of what Vancouver is like, we went. Similarly, I was genuinely curious about that “Once you visit Vancouver, you won’t want to come back” consensus. Now? I totally get it. And I can’t shut up about it. After 10 amazing days in Vancouver, I have not only made some of the most unforgettable memories with my favourite people, but I also picked my top 8 Things You Must Do In Vancouver, Canada. It’s as if the Granville Island didn’t already offer the most important things in life, like Lee’s Donuts and Kailyn & Hobbs Horseradish pickles. It also happens to house the Granville Island Boat Rentals. The best part? You don’t need a boating license. All you will need is a short tutorial and some trial-and-error practice, since the boat is easy to operate and essentially beeps when you exceed its limits. The better best part? You can see some cute seals, catch a beautiful sunset, and view the city from a unique vantage point. Lastly, aside from a hefty damage deposit, the rates are very reasonable and all of their ’14 places to see’ are well worth it. Bring Lee’s Donuts for snacks (you will not regret it). Be mindful of the places you would like to boat to, as some destinations require longer rental periods than others. Bring a hair brush for those wild tangles (not even funny!). Prior to the trip, I, potentially pretentiously, said no to camping, agreed to one mini hike, and focused my itinerary on Downtown Vancouver. 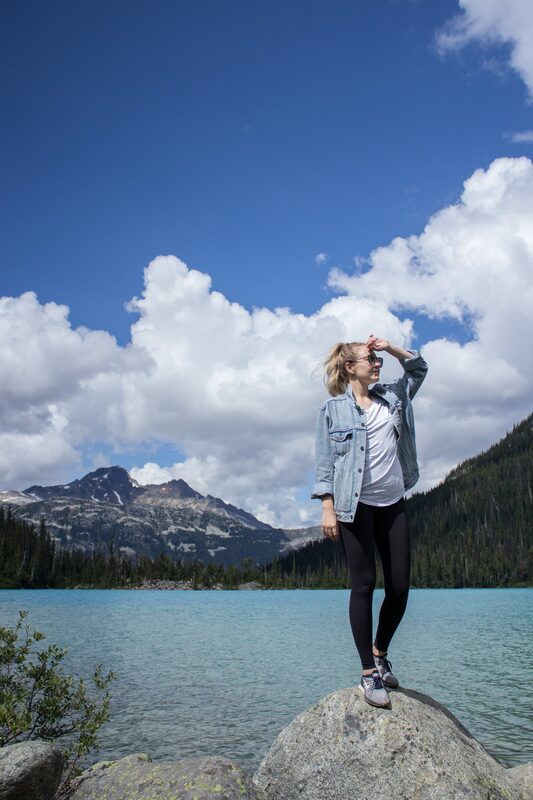 Yet, pictured here, I am enjoying the crisp air and purposely looking for bears in the distance, all after a 5K hike to Joffre Lakes. Yeah, I also don’t recognize myself. The Joffre Lakes Trail is rated as moderate in difficulty, takes a total of 4-5 hours (10K) to conquer, and includes 3 glacier-fed lakes. The lakes appear to be “purposely” and evenly spread out as to provide opportunities for scenic-intake and quick rests. While the main trail is a combination of dirt paths, steep man-made steps, and unstable rocks, you are sure to be rewarded with an up close view of the Matier Glacier. Upon reaching the Upper Joffre Lake, your feelings of accomplishment, or even invincibility, may prompt a swim in the turquoise glacier water. Yes, that’s 13-degree water, and yes, the brave (and crazy) soul, that also happens to be the love of my life, took a dip. Needless to say, we substituted the Capilano Suspension Bridge for this hike and came back from our trip with zero regrets. Bring some mild cheddar, pepperoni sticks, crackers, and craft beer for snacks (Who am I?!). Wear appropriate sneakers and bring a sweater, since the Upper lake is quite chilly. Come early or consider camping overnight as to make the Matier Glacier your 24-hour background. Chilliwack Lake is a prime example of the “everything-is-better-with-mountains-in-the-background” philosophy. There is just something so magical about coming up for air and being surrounded by forested slopes and alpine ridges. The crisp clean air and ‘chilli’ swims are a bonus. About an hour and a half drive East of Vancouver, Chilliwack Lake Provincial Park offers an abundance of hiking, camping (campsite and wilderness), and paddle sport opportunities. Bringing your own paddle sport equipment and understanding of limited campsite availability (only 146 spots) during the summer months is expected. One the other hand, a day trip filled with swimming, beachside lounging, and people watching, all with major blow-up toy envy, is also encouraged. The beach itself can be described as small, yet our visit on British Columbia Day (yeah, a Provincial Holiday) didn’t leave us feeling like sardines. Cute dog sightings only sweetened the deal. If quiet and remote spaces are your thing, kayaking or boating to find your perfect spot is a common occurrence. Regardless of your definition of relaxation, this valley-bottom lake serves up opportunities to please absolutely everyone. Bring repellant, as horse flies (I assume) appear towards the evening. Purchase a cheap floatie, as the near absence of waves allows for a natural lazy river experience. With the West Coast seafood reputation, this must-do shouldn’t be a surprise. An extra trip to Granville Island Public Market serves as an added bonus. There you will find a whole wing dedicated to the freshest, locally-caught seafood. Adding to the one-stop functionality of the market, picking up fresh veggies, kielbasa, and white wine can be done under the same roof. Grabbing some lemon squares for dessert on your way out is equally encouraged. Pick your seafood line up. Since, as per Snooki, “the lobster is the only thing alive before you kill it,” we left the kill-and-clean task to the professionals. The crab too. Grab your meat, veggies, spices, and wine. I am talking kielbasa, baby gold potatoes, corn, lemons, and Old Bay Seasoning. For wine, use a cheap white for cooking and one Sauvignon Blanc while cooking. Loosely follow a googled recipe(s). We jumped between this one and this one, while adding whatever else we thought was appropriate. If you pictured two witches making potion, you are on point. Enjoy getting messy. If I had a dollar for every time we flung some ‘boil juice’ at one another, I would have enough money to pay someone else to clean up the huge mess we made. I am talking wall-wiping. Overall, this Vancouver to-do proved to be a definite group effort and fun to prep for, make and eat. Maybe not to clean up. Hiking was definitely not the only ‘first’ on this Vancouver trip. I am proudly adding standup paddleboard-ing (SUP-ing) to the list. I don’t know whether it was the postcard-looking mountains, Joe hilariously falling into the water, or exchanging hellos with a seal that did it for me, but here I am, online shopping for a SUP for a cottage trip in 2019. True story. Indian Arm, the fjord of Deep Cove, comes with incredible scenery, envy-inducing waterfront cottages, and air that is so fresh (and so clean, clean). The Deep Cove Kayak Centre is the only rental centre there, offering great availability, experienced staff, and a range of tours to fit everyone’s exploring needs. Accessibility via public transport is a major bonus. Don’t forget to book the preferred rental in advance and online. For beginners, such as ourselves, 2 hour-rental period is a great start. Coffee lovers, this one is for you. Vancouver’s coffee scene is beyond impressive in its size, quality, and individuality. While each café differs in its unique start-up story and creative methods of production, their similarities lie in their passion, “bean to bar” practices, and source-transparency. It’s quite rare that independent cafés are able to co-exist, let alone thrive, with the world’s biggest coffee chain, Starbucks. Yet, with the perceived 3 to 1 ratio, respectively, and a café around every corner, your coffee possibilities are truly endless. Lastly, while barely even scratching the surface of the bean scene, I recommend Buro Espresso Bar, Dalina, 49th Parallel Coffee, and Caffé di Beppe for both your coffee and aesthetic cravings. Throughout history, Gastown, a National Historic Site of Canada, can be remembered as a survivor, an adaptor, and a community builder. Today, while housing local contemporary art galleries, fashion boutiques and tech businesses, it also presents some locally-inspired and beautifully designed restaurants. I found the food culture to be quite progressive in its transparency, with regards to its sources, as well as its pride in community support. Similarly, the fusion between traditional and modern recipes is celebrated with every meal and is consistently perfected throughout the seasons. Some of my personal Gastown favourites include Nuba, The Flying Pig, and Peckinpah (their Bourbon Caesars change lives). Lastly, and while a short walk just outside of Gastown, I highly recommend Chewies for oysters and drinks (the “Arbutus Pepper” Oyster shot is a must-try). Take advantage of the sea-to-table principle and indulge in the freshest seafood. Opt for a seat at the bar for a shorter wait time, personalized recos, and great chats with local bartenders. Adding to the already long list of Vancouver’s outdoor attractions, the Stanley Park’s Seawall is not to be overlooked. The popularity of the 9-km uninterrupted waterfront path should not be feared, either, but accepted, as it’s not without reason. Whether you prefer to walk (2-3hrs) or cycle (1hr), you will be rewarded with stunning views of the Lions Gate Bridge, downtown Vancouver skyline, and multiple beaches. The park itself, rendered a national historic site, is rich with peaceful trails, natural gardens, a dense urban forest, and First Nations’ history. With an overwhelming list of things to do and places to see, we recommend cycling as your mode of exploration. We entrusted Spokes Bicycle Rentals, located steps away from the start of the Seawall path. The rental process was quick and easy, the experienced staff provided us with a personalized experience, and the return process was a breeze, as well. Similarly, if any bicycle issues arise at any point of your trip, the staff come to YOU to fix it. Bonus points for efficiency via online booking. Avoid wearing a dress (me) and letting innocent bystanders know of the colour of your underwear (also me). 2-hour bicycle rental includes the full Seawall path, with time allocated for proper scene-intake and a snack. Hope you have enjoyed reading about my 8 things you must do in Vancouver as much as I have writing them. As you can probably tell, Vancouver has been one of my favourite trips and it can definitely be yours too. Lastly, I hope that you have found this list accurate, comprehensive, and, most importantly, informative. While travelling may be my selfish passion (guilty), my goals are to bring you not only my experiences, but also information and links that will be of value to your travel bug. With that said, feel free to say Hi, inquire about details, tell me about your experiences, and/or let me know of your travel questions and interests. *Major shoutout to Elysse and Michael, for their local insight and the most comfortable air mattress, as well as to mother nature, for not raining and waiting to unleash the heatwave the day after our departure. Thank you for the tour of Vancouver. I was there back in 1986 when they had the Expo and also went into town. I am glad that you enjoyed the tour! I can only imagine the changes that Vancouver has underwent since the 80s, Gastown and Granville Island especially. Thank you for stopping by, Robert. Hope you have a great day!